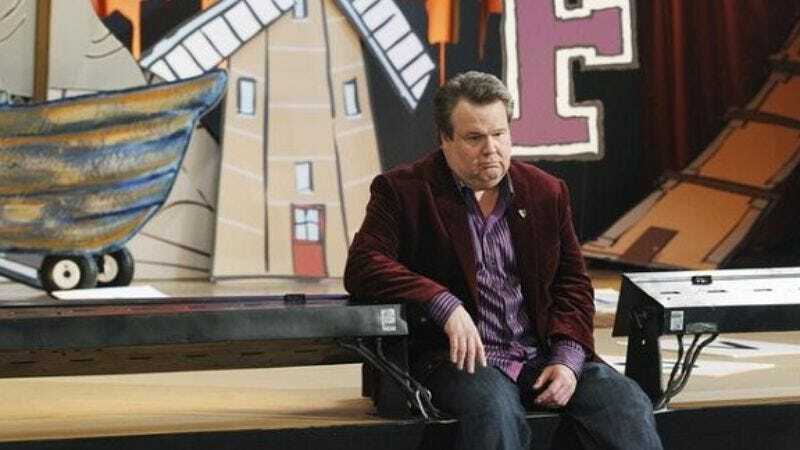 Modern Family: "The Musical Man"
There’s a fine line between reinvigorating a comedy staple and telegraphing the joke two acts away. Most of tonight’s Modern Family is the latter, unfortunately, thanks to the poorly placed ad on the Dunphy’s van and the tired sentiment of Jay and his brother expressing their love through fighting rather than words. And yet, even when the plots are moldy, this writers’ room is talented enough to uncover the possibility of a few zingers. Meanwhile Jay’s brother Donny (played by Jonathan Banks, better known as Mike the Cleaner from Breaking Bad, which renders each of his appearances on screen somewhat terrifying) has arrived for a visit. As Jay eagerly anticipates the practical jokes and insults to come, Gloria laments that the two of them never communicate and know nothing about each other. Sure enough, when Jay tries to get a conversation going, he finds out Donny has cancer—in remission—and he starts treating his brother with kid gloves. There’s one glorious sequence after Donny first arrives when Gloria and Jay are trading one-liners at breakneck pace. After Jay gleefully describes how he rigged the easy chair to fall apart when Donny sits on it to get a taste of the expensive Scotch, Gloria summarizes: “So you make your brother fall and spill his drink?” “I don’t want to jinx it, but that’s the plan,” Jay deadpans. And when Jay insults Donny’s shirt as originating in the ladies’ department, Gloria explains, “It’s funny because women are inferior.” But the failure of the storyline is signalled by the several laughless beats after Jay (of course) ends up sitting on the booby-trapped chair and collapsing onto the floor and by the entirely predictable resolution outside of Luke and Manny’s school musical performance when Donny explains to Jay that he doesn’t need concern, just the rough-and-tumble brotherly relationship they’ve always had. Predictable isn’t always a bad thing, but the writers didn’t find any surprises to build into this plot whatsoever. Even Cam’s megalomaniac musical ambitions for Franklin Middle School don’t pan out with the laughs they ought, mostly, I think, because Mitchell’s apologetic attempts to rein him in seem petty and under-motivated. But there’s a big guffaw at the climax, when the kids are supposed to reveal cards reading “WE LOVE THE WORLD” but end up missing the final “L” because Luke is stuck in a harness near the proscenium arch—then when the Franklin “F” logo is lowered, the message becomes “WE LOVE THE F WORD.” That’s pretty wonderful as a surprise disaster on top of the all-too-rote disasters that comprise the rest of the plot. As long as the show can pull off a few laughs like that, we’ll know it hasn’t gone too terribly wrong. But when it can’t seem to find anything fresh in the comic family tropes piled on its plate this week, there’s precious little joy in those laughs. Haley, desperate to escape the Sienna Slutmobile: “I’ll go home with anyone!” “That’s what it should say on the van,” Alex cracks.